The game features only 2 courses; the easier Laxey Coast track, and the more difficult TT course, which is both narrower and curvier. Each track has a mirror mode, so technically you have 4 options. The game also offers 2 game modes. 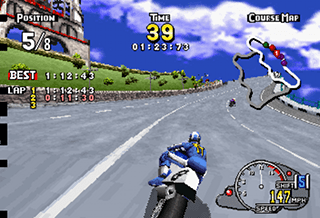 Arcade mode is (presumably) taken straight from the arcade machine, while “Saturn” mode features practice, challenge, and superbike (same courses, faster bikes) options. 2-player splitscreen is also available. There are numerous bikes from which to choose, and picking the one that matches your driving style is they key to success. In order to maintain a high speed, it’s important to keep the tires from skidding while negotiating turns, so if (like me) you’re the type who likes to floor it the whole time, you have to pick a bike with less responsive handling. The catch to doing that is that you’ll have a tougher time with the snake-like TT course. Although it supports both standard and 3D controller use, I don’t recommend using the stock controller. The original arcade machine used a ride-on bike set-up, which of course means analog steering and analog gas/brake on the grips, and that’s what it’s optimized for. Using the standard controller it’s very hard to avoid oversteering, and you can’t simply back off on the gas a bit to take a tighter turn. Manx TT defaults to a first-person view, which I also don’t recommend. One quick tap of the X, Y, or Z button will bring the camera back into a much more friendly third-person position. There is some minor draw-in (think Daytona CCE, not the original), but overall the graphics and animation are great. The music is pretty standard for an arcade racer, as are the sound effects. The opposing racers are very good, requiring a near-perect race, and that’s what keeps the game interesting. Manx TT is an easy recommendation to any fan of the Daytona or Sega Rally games. Buy Manx TT Superbike on GameGavel or Amazon. Tagged 1997, Manx TT Superbike, Motorcycle, Racing, Review, Saturn, sega. Bookmark the permalink.